It's hard to underestimate the influence that The Clash had on a rock bands everywhere with their raw primal sound. That said, the band departed from the norm on "Rock The Casbah," the third single from their huge platinum album Combat Rock. 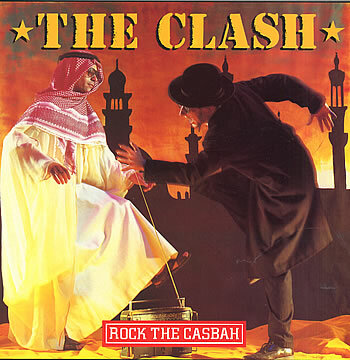 What's different about this song from most of the other songs in The Clash catalog is that it's based around a piano which was played by drummer Topper Headon (who also played bass, drums and percussion on the recording). Here's what to listen for. 1. The basic piano is lightly chorused (very popular in the early 80s) and has a wide stereo image that you can hear shift as the midrange notes go from the center to the higher notes on the right. 3. The opening riff is very heavily chorus to where it begins to detune. 4. Note the nice long delayed reverb. When we first learn about audio we learn about the basics of frequency, usually by being shown some 2 dimensional graphic of different frequencies. We rarely see a real-life example with the except of perhaps an oscilloscope looking at a series of sign waves. Here's a great example of the vibrations of acoustic guitar strings looking up from the soundhole. It's pretty cool to look at, but it also shows you frequency in action. Thanks to my buddy Jesse Jaye for the heads up on this. 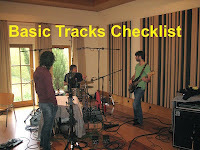 Before you can prepare for the recording you need some essential information first. Here’s a list of the minimum that you must determine in advance of the session. What type of music will be recorded? How much recording time to do you think you’ll need? How many songs do you expect to record? Who are the musicians (If you know some of them it might affect your setup)? Who’s the producer (if you’re not talking to him already)? What time does the session begin? Does that mean the downbeat of recording or when the musicians are expected at the studio to load in? How long do you expect the session or sessions to go? How many musicians will be playing at once? How large is the drummer’s kit? How many toms will he be using? Will the guitarist(s) be using an acoustic or electric? What kind of amps will the guitar player(s) and bass player be using? Do any of the players expect to use house gear like drums, guitar amps, or keyboards? How many cue mixes will be required? Will there be a scratch vocal tracked at the same time? Will they bring any special outboard gear or mics that they’d like to use? Will they be tracking to a click or loops? Do they require any particular instruments, amps or effects? 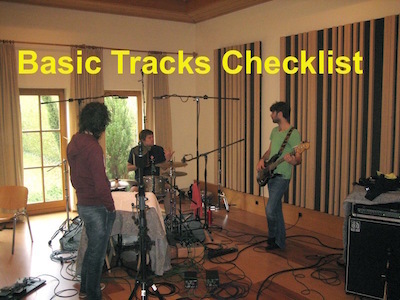 Determining the above before the musicians arrive at the studio can go a long way to achieving a quick and easy setup and an efficient session. TIP: Don’t ask for the setup information too far in advance since much can change by the day of the session. Getting the info the day before the session is usually sufficient. Here's something that I posted a about 3 years ago that I felt I should repeat. There are a number of questions that I constantly get from emails, blog comments, Facebook, Twitter, YouTube - you name it. The same themes keep occurring so I want to set a few parameters so I can help you better. Look, here's the deal. I promise I will do my best to help you if you have a specific question! That said, when you make a question too general you put me in an impossible situation in that you probably don't really want to hear any criticism in the first place, you just hope that I'll fall madly in love with your music and open every door in Hollywood for you. I wish I were that powerful or had those kinds of contacts. If I tell you "This is no different than something I've heard a hundred times before," or "I have no idea. I don't know your market," you're going to say, "That guy doesn't know what he's talking about," or "He doesn't want to help me." Let's face it, you really weren't looking for a critique in the first place. You were looking for help placing your music, which I can't provide. That's why specific questions are the only way you'll get a specific answer from me. 1. Take a listen to my song I just sent you. First of all, I wish I had the time to listen to all the songs that people send me but I don't. Please don't take it personally or feel offended. There's only so much time in the day and most of it is taken up already. That said, I'll TRY to listen to your song only if you have a specific question, but it must be a stream and not a file that you sent me. There's a potential legal issue if I accept a file, sort of like record labels not accepting any unsolicited material. Put it on YouTube with a private link or on Soundcloud, ask a specific question, and I'll try to have a listen. 2. What do you think of my song? Go ask your fans. They're much more important and relevant to your success than I am. You do have fans, don't you? 3. My songs are on iTunes or We just finished mastering our album...... Sorry, it's too late to ask any questions about it. You're product's already complete. 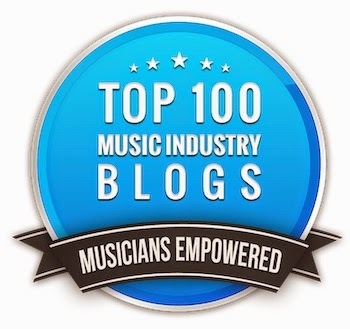 If you want advice on distribution or marketing, go to the Music 3.0 blog, but check the archives first, and once again, be specific with any questions. 4. Will you listen to my CD? See above. 5. Give me some feedback. On what? The mix? The songs? The arrangement? The production? The sound? A question like this makes me think that you're only looking for a pat on the back. 6. Which song is the most commercial? Once again. Ask your fans. They're the ones that count. And by the way, so many times the song that you think is least commercial is the one that everyone likes anyway. 7. How can I make my songs better? Do you really want to hear me tell you to write better, play better, and use better sounding instruments? That's a good place to start before you even ask the question. 8. Can you introduce me to.....? Nope, I probably don't know them, and if I did, it's unlikely that I'd introduce you unless I knew you a lot better than just from an email. When I introduce people, my rule of thumb is that both people will be so happy at the result that they'll call me the next day to thank me. Do you fit into that category? 9. Can you introduce me to publishers, record labels, etc? Nope. You probably know more of them than I do at the moment. Here's a tip. To meet publishers, join the AIMP for 60 bucks a year. Want record label contacts? Try the A&R Registry. 10. I have some songs that I'd love to get to ..... Sorry, I'm not a publisher and I barely have enough time for my own things as it is. 11. Will you write with me, or can I writer with you? I don't write songs anymore, and if I did, I'd do it alone. 12. Can I watch you work in the studio, or Can I visit you in the studio when you're working? Highly unlikely. If I'm working in the studio, I'm with a client who I can guarantee doesn't want any distractions from people that they don't know. 13. Will you produce, record, mix my band on spec? Nope. My time is valuable and I get paid well for it. That said, I'm booked far in advance so it probably wouldn't fit your time frame anyway. 14. Will you partner with me on a project? Only if there's some money involved, and even then, I have to be absolutely in love with the project first. I no longer work on anything that doesn't knock my socks off. 15. Wait, don't listen to version 7 of the mix I just sent. Mix 9 is so much better. You've wasted my time. Next. 16. A full quality recording is attached. Next. I already told you I will only listen to a stream because of any potential legal issues that might come with a file download. 17. What should I do to get my music noticed? Sorry but there's not enough time to write you an email that long. I already wrote a book (call Music 4.0) that tells you all that, or you can read my Music 3.0 blog every day for free. 18. Can you send me one of your books for free? Nope. I don't get that many complimentary ones myself, and the rest I have to pay for. 19. I'm from (pick a country) and I want to translate your books. I have 3 book publishers that control my copyrights so you'll have to ask them. I have no say in the matter. Be aware that they'll probably want some sort of a license fee. 20. 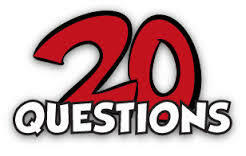 Can you please answer these 10 questions to help me with my desertion? I'm sure you want answers that are sufficiently helpful and thoughtful, but I'm slow at writing and it takes me a looong time, so I really can't do this via email. I'm really happy to talk to you via Skype however, and answer every question and more. Make sure to record it because you'll get more info than you ever expected. If you're happy with a one sentence answer to your 10 questions via email, no problem, but neither of us will probably like that. How do you do (name the technique)? Finally, a specific question. Ask away. I'm pleased to help if I can. Do you think the bottom of this song is too big? The song isn't working. Can you tell me why? How can I get the vocalist to sing in tune? How do I get a better guitar (bass, sax, piano, etc.) tone? What can I do to make the reverb work better with the track? What can I do to make the drums punchier? See what I mean? With a specific question I can get right to the core of the problem and help you. So feel free to ask away. I met Shan Dan Horan a few years ago on a conference panel that we were both on and I was immediately impressed how much he felt the pulse of the current music scene. 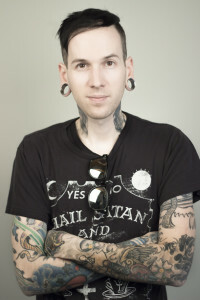 At that point he was head of new media (meaning all the online activities) for the Century Media label, and today Shan Dan's the VP of operations for the big indie label Artery Recordings. On the podcast we talk all about artist promotion online, the trends he sees as well as the mistakes that artists make and some of the things they can do to really raise their profiles. On the intro I discuss how Amazon Prime Music is becoming a big streaming source while staying under the radar, and the demise of New York City's famous Music Row. It may be hard to believe but in the days before hardware digital reverbs and plugins there were few inexpensive ways to generate ambience during a mix. Not many studios had the room or the expertise to build a live chamber and plate reverbs were expensive, leaving the lowly spring reverb as the only low cost alternative. That being said, there was a very well made high-end version of the spring reverb that found its way into many studios - the AKG BX 20. Many an engineer loved the BX 20 sound, but there weren't many originally made and there are even fewer around today. That's all been changed with the introduction of Universal Audio's plugin version of the famous reverb. UA emulated what they felt was the best currently working example of unit, one owned by producer Jon Brion. While the plugin has all the parameter controls of the original unit, UA also included a few "digital-only" features like decay, volume and pan, link, dry/wet blend, predelay and low cut filter, none of which are found on the hardware version. The UAD BX 20 spring reverb plugin works on UAD-2 hardware and Apollo interfaces and is endorsed by AKG Acoustics, the original maker of the hardware unit from the 60s. The price is $199. Check out the video below to hear what it sounds like and go to the UA site for more info.